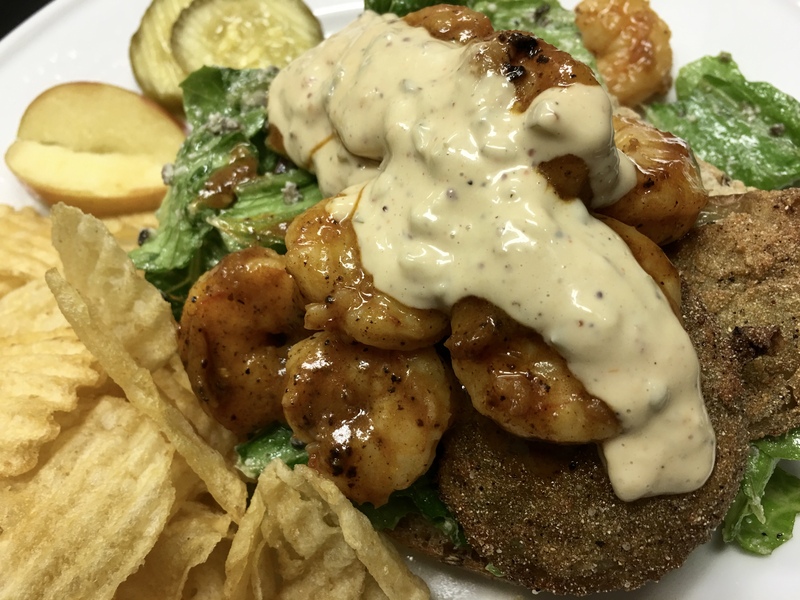 The Byrds sang it so well, “Hey Mr. Po-boy man, save a shrimp for me…in the jingle jangle Friday I’ll come following you.” Come join us for some wonderful food and hear George hold forth at the constitutional convention. Here’s what we’ve got cooking for you this week: Chicken and dumplings, pulled pork tacos with fresh salsas, chicken and sausage jambalaya, and a shrimptastic po-boy Friday. Chicken and dumplings. These dumplings come seeded with herbs in a house-made stock and cream sauce, and there’s no more elegant way to head into the weekend than with a sumptuous dish of house-made chicken and dumplings. The longest day of the year, or what we call the summer solstice, happened yesterday. It means summer is officially here — as if we didn’t know it by the heat. Well, come beat the heat and enjoy those longer days with a little of our chicken and dumplings. Pulled pork tacos, Spanish rice, beans, cilantro lime slaw, and fresh salsa. Our pulled pork chopped and served on lightly fried corn tortillas with Spanish rice, beans, lime cilantro slaw, and fresh salsa will redefine “getting over hump day” for you. Famous chef James Beard admits, “If I had to narrow my choice of meats down to one for the rest of my life, I am quite certain that meat would be pork.” Well said, Brother Beard. Nothing like pork to make our lives a little better. Chicken and sausage jambalaya. Well, Cajun calling! What’s better than a delicious, hearty mix of chicken, sausage, rice, and tasty goodies? Well, this week many years ago in 1788, the U.S. Constitution was ratified with New Hampshire becoming the ninth state to ratify what has become the longest-living written constitution in the world. Do we know how those delegates worked so feverishly and so well? Chicken and sausage jambalaya for all (with a little bit of wine thrown in for good measure). President George Washington even said, “Thanks to the chicken and sausage jambalaya, the Constitution is the guide which I never will abandon. Pass me some more, please, Mr. Adams.” Yep. Who knew? Shrimptastic Friday: Barbecued shrimp stuffed po-boys or fried green tomato and shrimp po-boys with house-made remoulade sauce. Take a half-size po-boy, hollow the bread to make a bread cave, stuff it with our own New Orleans style barbecued shrimp (prepped in loads of butter, white wine, and saucy spices), cover it with barbecue sauce, and grab the napkins. Or grab our fried green tomatoes, add some shrimp sautéed in our barbecue sauce, our house salad with house-made dressing, some remoulade sauce, and you’ve got a little more than a po-boy, you’ve got a “Whoa-boy.” Can you believe that during this week in 1964, The Byrds released their great album, Mr. Tambourine Man? Seems like only yesterday we were singing the strains, “Hey, Mr. Tambourine man, play a song for me, I’m not sleepy and there is no place I’m going to. Hey, Mr. Tambourine man, play a song for me in the jingle jangle morning I’ll come following you.” Well, thus began the folk-rock revolution. We think the song ought to be “Hey Mr. Po-boy man, save a shrimp for me…in the jingle jangle Friday I’ll come following you.” Yeah, you, too, can sing “Hey Mr. Po-boy Man” this Friday — come join us at the table, we’d love to see you. Our old friend and author Henry James swoons, “Summer afternoon, summer afternoon; to me those have always been the two most beautiful words in the English language.” Well, there you have it. We might say “shrimp po-boy, shrimp po-boy,” those are rather beautiful words, too. Heck, “summer afternoon” plus “shrimp po-boy” sounds like a short trip to heaven.